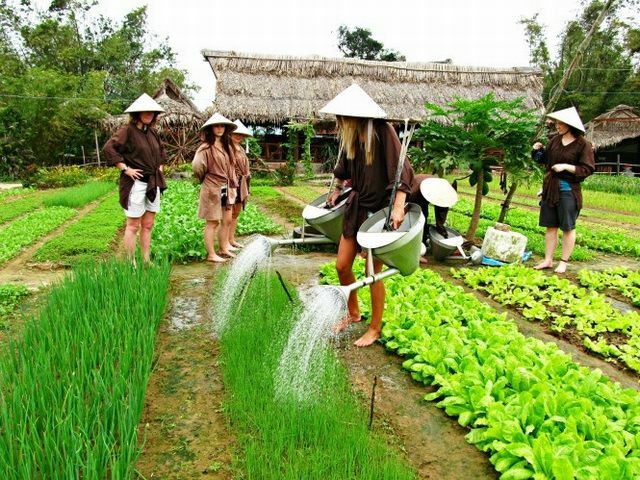 Tra Que Village – Hoi An Eco Tour: The short lesson doesn’t stop with a brief introduction to village’s story. Tra Que – a little charming village lies on the edge of Hoi An, It is named after the sweetly scented vegetable. these vegetables not only make the Pho Hoi ‘s meals more sweet with different flavour but also make Hoi An specialities such as Cao Lau, Quang Noodle more memorable.If you come here to the village , you can also enjoy the cooking class conducted by the host with local “Tam Huu” spring roll which is primarily made from Tra Que vegetables or pancake with meat ( Banh xeo ) which is made with the enlivenment. 08:00: Local guide will see you at your hotel with your bicycle. you will cycle to a local farm in Tra Que village.